Ta Fantastika - TBS - travel agency for all your travel needs in the Czech Republic! The TA FANTASTIKA Black Light Theatre was established in 1981 in New York by Petr Kratochvíl. 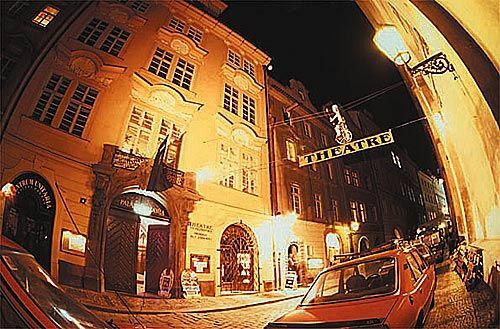 On his return home in 1989, he founded the TA FANTASTIKA PRAGUE theatre. The new theatre enjoyed immediate success in Czechoslovakia, and later in the Czech Republic. In 1993 it moved into a permanent home in the UNITARIA Palace in Karlova Street. Type of staging, which can be understood by all and presents no language barrier, ensures that our performances are so popular and in demand world-wide. As an example, our Aspects of Alice show has been running for almost fifteen years, with almost four thousand performances playing in thirty countries over three continents. A classic black light theatre performance on the theme of Lewis Carroll´s "Alice in Wonderland". This show has amazed audiences in over thirty countries in three continents with its imagination, poetry and perfect technical tricks. This is not a word-by-word theatrical rendition of the original, but it begins at the point where Alice comes to the end of her childhood. The author enables you to use your fantasy to make this stage Alice experience all the beautiful moments of growing-up, her first loves, awakening adulthood, understanding of life, laughter and tears, joy and sadness.